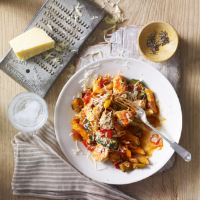 Our essential Waitrose Grilled Vegetable Mix can be used straight from frozen and saves all that chopping and grilling. 1. Heat the oil in a frying pan, stir in the garlic and chicken chunks and fry for 10 minutes. Meanwhile, place the penne in a large pan of boiling water and cook according to pack instructions. 2. When the pasta is just cooked, drain and return to the pan. 3. Stir the grilled vegetables and pasta sauce into the chicken, with the chopped ham. Cook for 5–10 minutes until the chicken is cooked through and there is no pink meat. Season with freshly ground black pepper and mix well. Stir in the pasta. Transfer to a serving bowl, scatter with the cheese and serve with a crisp green salad. Add a 25g pack fresh basil, stalks discarded and leaves torn, and stir into the mixture with the pasta sauce. Make it into a pasta bake: pour the mixture into a shallow ovenproof dish, top with grated Cheddar or mozzarella and bake in a preheated oven at 200°C, gas mark 6, for 25-30 minutes or until the top is crisp and golden.